This is an 18th-century copy of Ralph Treswell's 1610 survey of the property east of Grey Friars. Although better known as a painter in his lifetime, Ralph Treswell was also a mapmaker and one of the first land surveyors of the modern era. 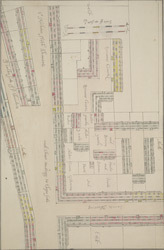 The plan features a scale bar at the top centre, with orientation points marked on the margins. The facades of the various private tenements and the Shambles on Newgate Street are shown pictorially.